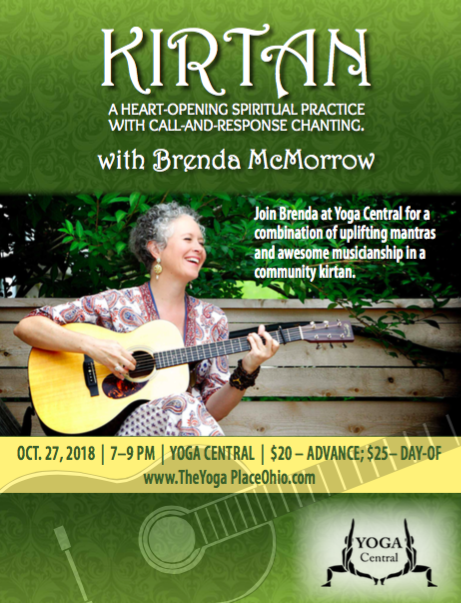 Yoga Central, The Yoga Place and Yoga Shala are happy to invite you to a Kirtan with Brenda McMorrow! This event will take place at Yoga Central, 4626 Cleveland Ave. NW Canton, OH. 44709 on October 27th, 2018 from 7:00pm-9:00pm. Brenda weaves English and Spanish lyrics with ancient mantras, singing simple and beautiful melodies to the crowd and the crowd responds by singing back. Kirtan is a beautiful opportunity for people to come together to open their hearts and chant the many names of the Divine. In Kirtan, the lines between musician and audience are blurred. The audience members play a vital role in the music through their singing, clapping, dancing and the transformative devotional energy that they each bring to the experience. Tickets are $20 in advance online at www.theyogaplaceohio.com or $25 on the day of the concert, at the door.